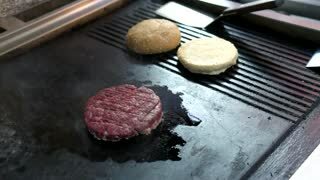 Cook makes meat medallions for burgers. Pouring spices pepper and salt. 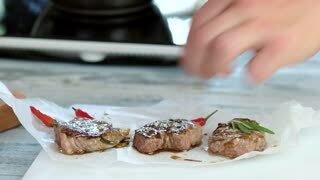 Meat marbled beef lies on food wooden board for cutting and red pepper chili. 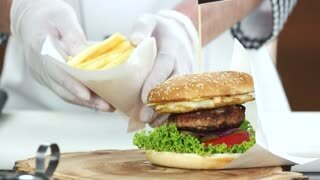 Chef in black food gloves makes cutlet medallion. Medallions with chili peppers. Chef adding sauce to food. Meat medallions with herb. Rosemary and small chili peppers. Meat medallions and chili peppers. Cooked veal on board. Raw burger patty. Male hand with pepper mill. Quality beef for sandwich. Meat medallions with sauce. Chili peppers and walnuts. It's lunch time. 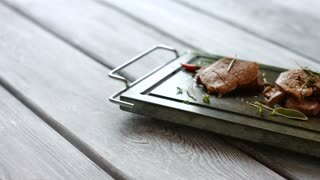 Green tray with cooked meat. Chili pepper and brown meat. Taste the delicacy. 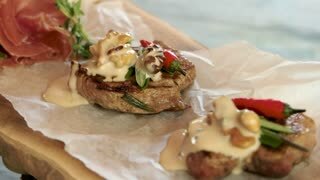 Veal medallions on stone tray. Hands put herbs on meat. Dark tray with meat pieces. Delicious meat cooked at restaurant. Chili pepper and veal medallions. 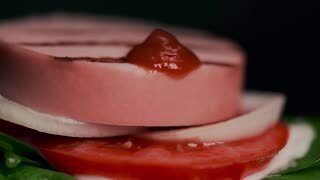 Beef burger macro. 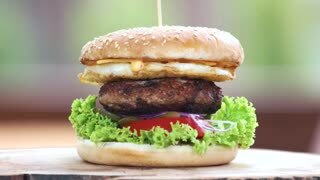 Bun, egg and meat. Hands of chef, fast food. Beef burger and fries. Beef burger with cheese. 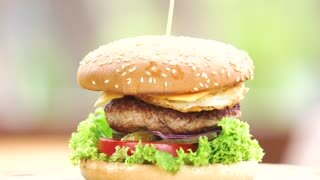 Bun, meat and vegetables. 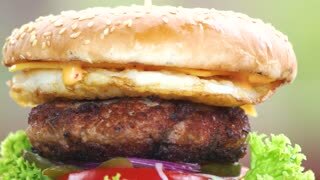 Beef burger with egg. Food close up.